(July 11) Check out the last piece of information on WAAC 2013. Every participant will be able to have a hard copy of it on site, too. See you soon!. (July 9) Check out how to get to the workshop site. (June 26) Pre-registration is still available! And more rooms at Hotel Castle are available! (June 19) Program(tentative) is now up. (June 10) Some travel information is added. (June 1) Pre-registration is open. Check out our guide to how to get to the workshop site. 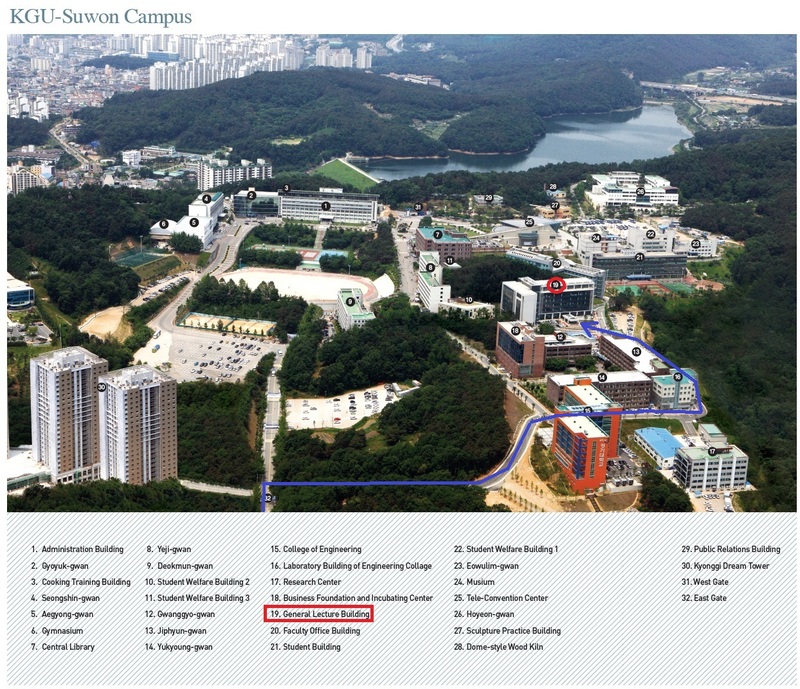 Kyonggi University is located in the eastern region of Suwon. Once you get in Suwon city, the best way is to take a taxi. It's relatively cheap (at most KRW 10,000 from anywhere in Suwon). Suwon city is located 30km south of Seoul. There are many bus or train connections to Suwon from Incheon Airport, Gimpo Airport, and other central places of Seoul. A recommended route from Incheon/Gimpo Airports is by bus. Take a bus for "Suwon" and get off its destination "Hotel Castle" from either airport. The bus line is quite frequent and the quickest way to get in east Suwon. Closest to the workshop site and just next to the Airport Limousine Terminal. A shuttle bus will drive you to the workshop site in the morning on July 12 and 13. We are negotiating more service and/or discount for WAAC 2013 participants who staying at this hotel. You then will get replied with a confirmation from the hotel. There are a couple of other choices. The map below is being incrementally updated. So check the map just before departure. It now shows the locations of the workshop site, hotels and remarkable sites with description.